Circling the city of San Gimiginano are countless olive groves and vineyards. As I drove down every back road, up every hill, and through every piece of property I could find, I was searching for that perfect shot. I had visited San Gimiginano years early and had been captivated ever since, anticipating the day I’d be back to properly photograph this beautiful hilltop town. Finally I found the composition I’d been searching for. 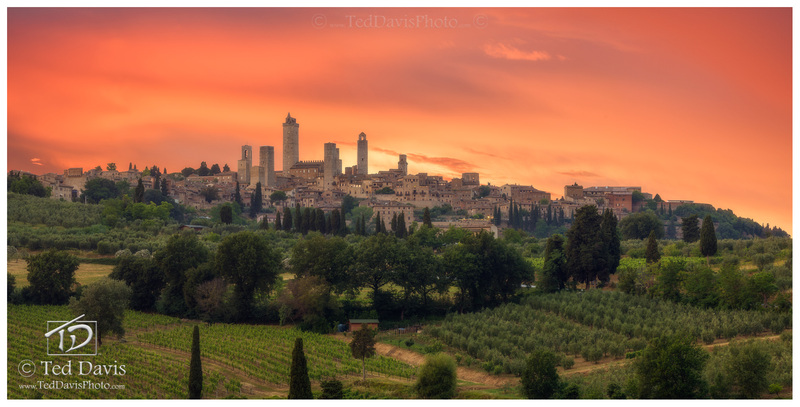 As sunset approached, with olive groves and vineyards spanning the hillside, I was absolutely floored when the sky began to glow. A deeply radiant orange sky with wisps of deep red stretched towards the horizon. As the sunset reflected off the town’s towers and windows, I finally captured San Gimiginano the way I had only imagined in my dreams. Photo © copyright by Ted Davis.